These High Roller Poker Chips are the latest edition to our Poker Chip Collection. These chips have several great characteristics that help to separate them from the standard style of poker chips. What makes them unique however, is the high quality graphic that is embedded as part of the chip. This graphic is NOT a sticker and will never peel or show any kind of lift from the chip. The graphic is part of the chip! The 5, 25, 50, and 100 have a poker hand sporting a Royal Flush, each in a different suit. The 1 chip sports a spectacular hand of 4 Aces. The best part about these chips is that they already have the denominations on them but are not locked into being either dollars or cents. The 5, 25, 50, and 1 chip can be used as either Dollars or Cents, making them extremely versatile for the user. 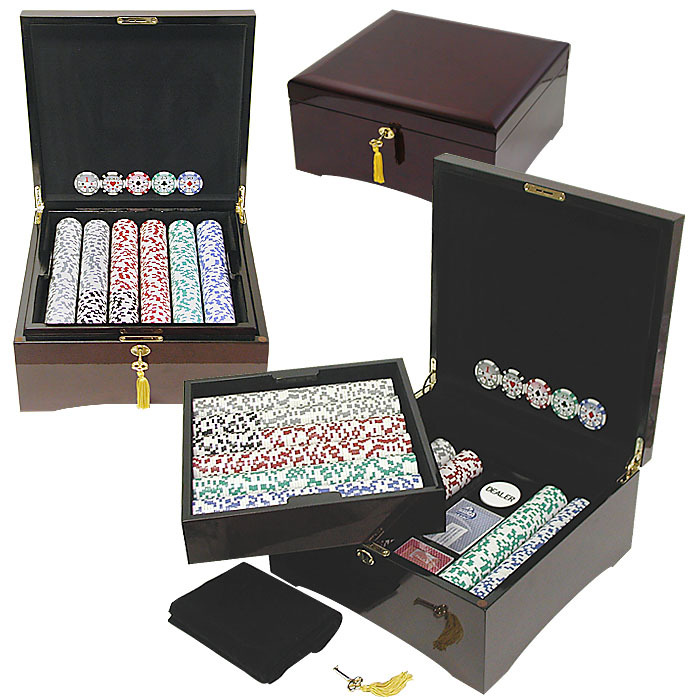 This beautiful dark wood poker chip case is one of the finest cases we have ever sold. At first glance it may resemble a fine cigar humidor. It is a deep dark stained wood and is very solid with all-wood construction with 1/2 thick pieces. The finish on this case is a brilliant, highly polished laquered finish. Need a mirror? Use this! The tray inside is removable, revealing a bottom layer that holds chips, playing cards and a dealer button. The woodwork on the inside and outside is as fine as any piece of furniture in your house. The sides and bottom are lined with soft black felt. The hardware on this case is solid brass. The best feature of all on this case is the key lock to keep your poker chips secured. The key itself is artistic and also fits in with the decor. It is an old style key made from solid brass with a tassle hanging from it. This is a collector's item as well as a fully functional chip case for the person who appreciates the finer things in life. The top rack in this case comfortably holds 450 chips as the bottom rack holds 300 chips for a total chip capacity of 750 chips. Also on the bottom there is enough space for 2 decks of cards and a dealer button for all your Texas Holdem games. Chips, cards and button sold separately. The case is 13 inches by 12.5 inches and stands 6.25 inches high when in the closed position. As a bonus, we are including 2 decks of playing cards and a professional dealer's button. "Playing cards depicted are subject to change without notice. It is at our discretion to replace playing cards with a similar product of equal or higher quality at any time."